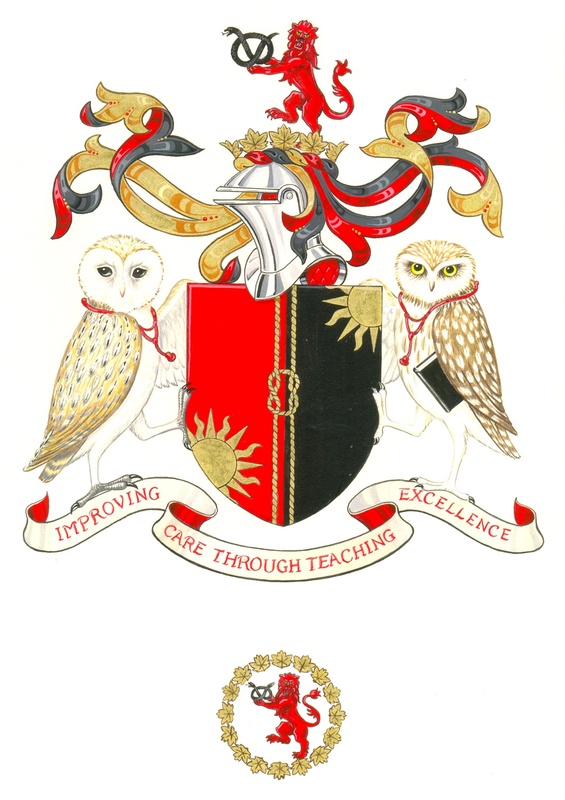 Have you ever wondered what our coat of arms is all about? The red and black of the arms represent pain and the unknown; the suns bring enlightenment from both sides. The Supporters are two owls - a barn owl on the left and a little owl on the right. They both symbolise wisdom, the former being particularly British and the latter a symbol of Minerva, goddess of wisdom. They are both wearing stethoscopes. The barn owl is the student and the little owl, with a book under her arm is the teacher. The ropes and knot represent the patient-teacher-student relationship. The lion symbolises Britishness (a Scottish lion with an English face), and it is holding with care in its cupped paws a serpent, which in heraldry alludes to medicine. The Lion is standing on top of a gentleman's helmet whose wreath is made from leaves of the tree of Hippocrates at Kos, under which he taught his pupils the art of medicine.